Prior to the advent of composite mixes of materials used in hockey stick manufacture, a hockey stick weighed more or less dependent on how big it was. Since then the hockey stick makers have been able to design specific weighted hockey sticks to suit the needs of the player. Each hockey stick brand carriers a weight guide for their sticks, Extra Light, Light and Medium are the common grades with heavy being available in some options and bespoke hockey stick commissions. These grading’s are not universal across all brands and each manufacturers hockey stick will weight slightly less or more dependent on their own grading’s. Also a consideration is the material used, how long it is, how much of the heavier materials are used in the head or shaft etc. We try in all of our review of hockey sticks to give the weight implications of that individual stick based on the key differing factors relevant to the hockey stick we review as well as some real life feedback. Generally speaking hockey players decide to carry a lighter stick that has more feel and with strong materials does not loose its strength. However the position you play, your personal strength and style can be deciding factors in choosing a weight of hockey stick to best suit your needs. As in the consideration of the choice of a hockey sticks length the main thing you should consider is if you can control the head of the stick as you strike the ball. Too light and you could either over swing and turn the head when it impacts the ball or as it strikes the ball it may open giving a cutting effect on the hit. Getting the right weight is hard to gage without picking up the hockey stick and trying it. However you can make some assumptions by comparing what you are used to or gaging the actual weight of a hockey stick, which are now manufactured in a repeatable process, and often offered exactly by the hockey stick brand. Your playing position: Attackers will enjoy the higher impact on the ball that a heavier stick can give, it will hit the ball harder and as long as you are strong enough to control the head can make your shots more powerful against the goal keeper. A defender would benefit from the agility of a lighter stick with a strong shaft that will allow them to react more quickly to the need to put in a tackle. A midfield hockey player would choose a balanced hockey stick to give the benefit of both. Your actual strength: For all the macho players out there don’t just buy the heaviest stick possible as using a stick that is too heavy for you may affect your ability to play hockey well. Note the points above, finding the best hockey stick for your style is based on many factors of how you actually play the game. However, like length, pushing toward the heavier stick will allow benefits to your hockey game especially if you need to hit hard. As mentioned above hockey sticks come in a few standard weight classes and reading our reviews of hockey sticks will help you determine the slight nuances between each hockey stick brand with regards to weight. As a general rule the weight range of a hockey stick is from around 510g to 670 grams in 30g to 40g sections from extra light to medium hockey sticks. 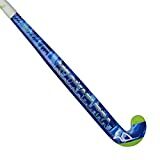 The regulations suggest you can have a hockey stick of up to 740g but to purchase one of these sticks is hard off the shelf, you generally have to special order them. This would suggest how unpopular a really heavy hockey stick is. From this graph the most notable statistic is that hockey sticks, within a grading like ‘Light’ can vary in weight by up to about 60g, so read our hockey stick reviews carefully to understand the hockey stick materials used and real life examples of the hockey stick weights to make an informed decision on which weight will suit. Obviously if you are changing hockey stick you will know how much your current hockey stick weighs and can use information on this site and our specific review of hockey sticks available and also further information about each hockey stick brand to make a decision on buying a hockey stick.